You know, until about a couple of years ago, I used to think that one of the saddest things ever was eating in a sit-down restaurant alone. That, going to the movies, and maybe even on vacation. Well, I’ve grown accustomed to doing all three alone and have become okay with it. So, I shouldn’t be surprised that I decided to venture out of my house and eat out alone on Valentine’s Day, of all days. 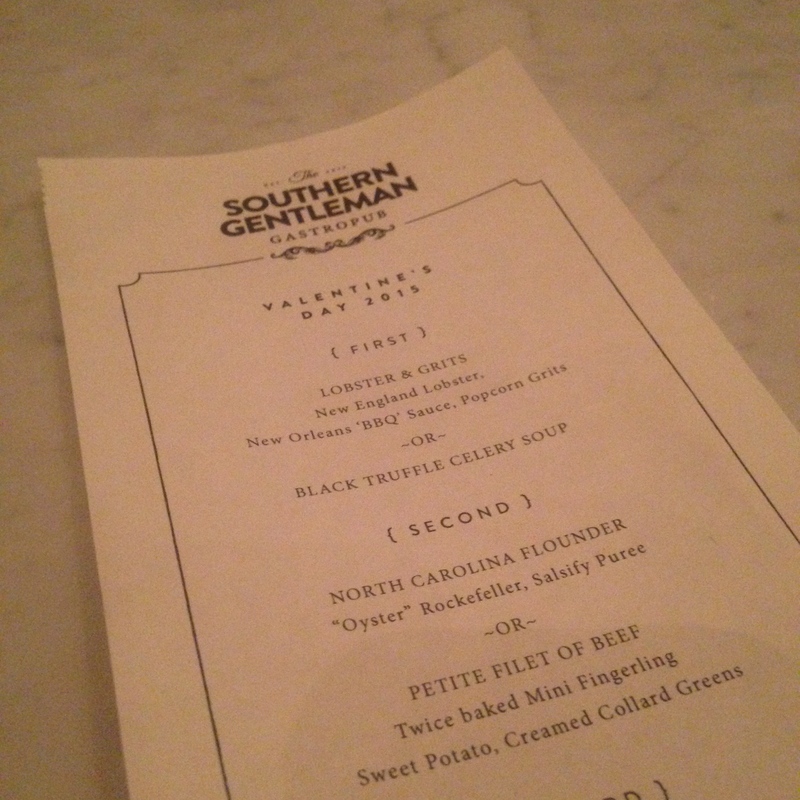 For tonight’s solo dinner, I selected The Southern Gentleman, which recently opened in the posh Buckhead Atlanta development. The restaurant is touted as a gastropub serving, according to their website, “barrel-aged cocktails to bottled libations to adult beverages on tap, along with New World wines and craft beers and the ‘perfect’ mint julep”. Unsurprisingly, the place was quite busy. But for some reason, the business didn’t take away from this place’s coziness. It’s got a nice laid back atmosphere that’s pretty welcoming. In an oxymoronic way, the place can feel very intimate, even if it’s crowded like it was tonight. Lion’s Tail Cocktail. Nice, warm, and mellow. I couldnt decide which cocktail I wanted (they have quite a bit to choose from), so Matt behind the bar fixed me up with a Lion’s Tail, which was made with rye, green chartreuse, lime juice and allspice dram. To be honest, I had never even heard of the latter before my dinner. But I guess we all learn something new every day. It was really good too. And it kind of gives me a feeling that it was the kind of drink that someone during the Mad Men era would drink. It was kind of similar to that cocktail I had at Grain a couple of weeks back with the element of spice. But I like spiced cocktails, so this was fine by me. Good job, Matt! I had lobster and grits as an appetizer. 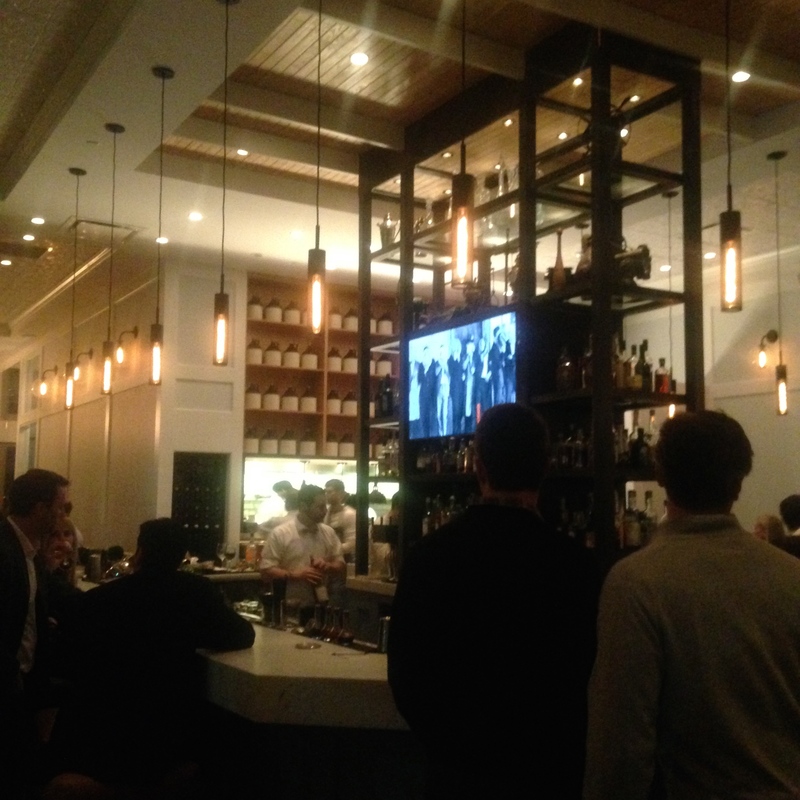 The kitchen deviated from the regular menu and had a special menu for Valentine’s Day. I wasn’t expecting this, but I played along. 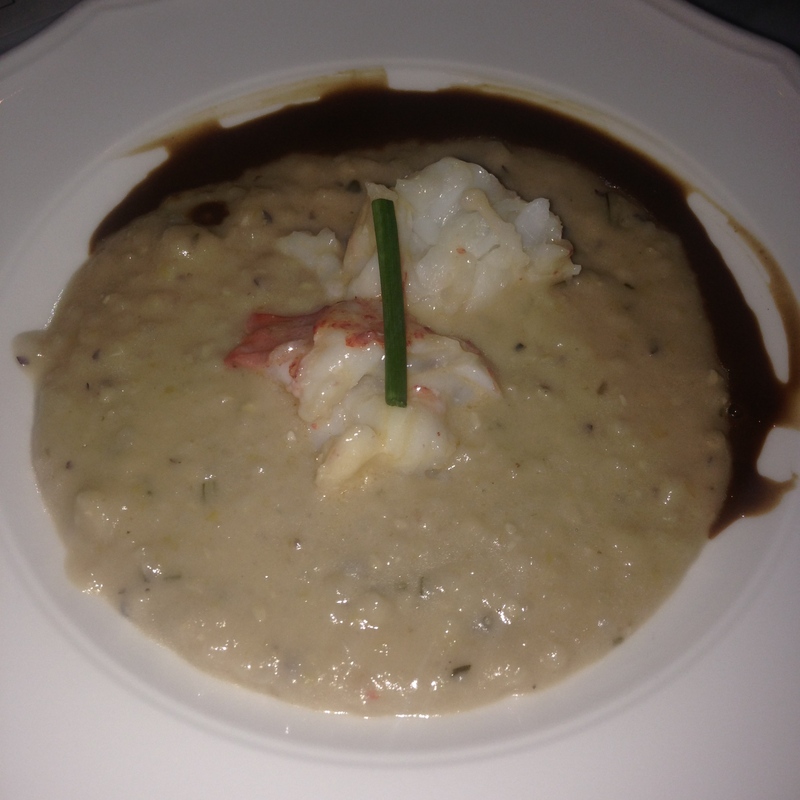 So, I started with the lobster and grits. It was alright. Wasn’t blown away by it, but not disgusted either. Although I know this was an appetizer, I was expecting the serving to be a bit more generous. It also probably would have been better with a little more of the “New Orleans BBQ Sauce” it came with. But I did really enjoy the coarse texture of the popcorn grits they used, which sparked a conversation about grits with the guy from Australia I was sitting next to. Of course, it’s a refreshing change from the Jim Dandy Quick Grits I grew up eating. (No offense, Mom.) So, not bad. But could’ve used a bit more flavor in my opinion. North Carolina Flounder. Moist, tender, and very flavorful! 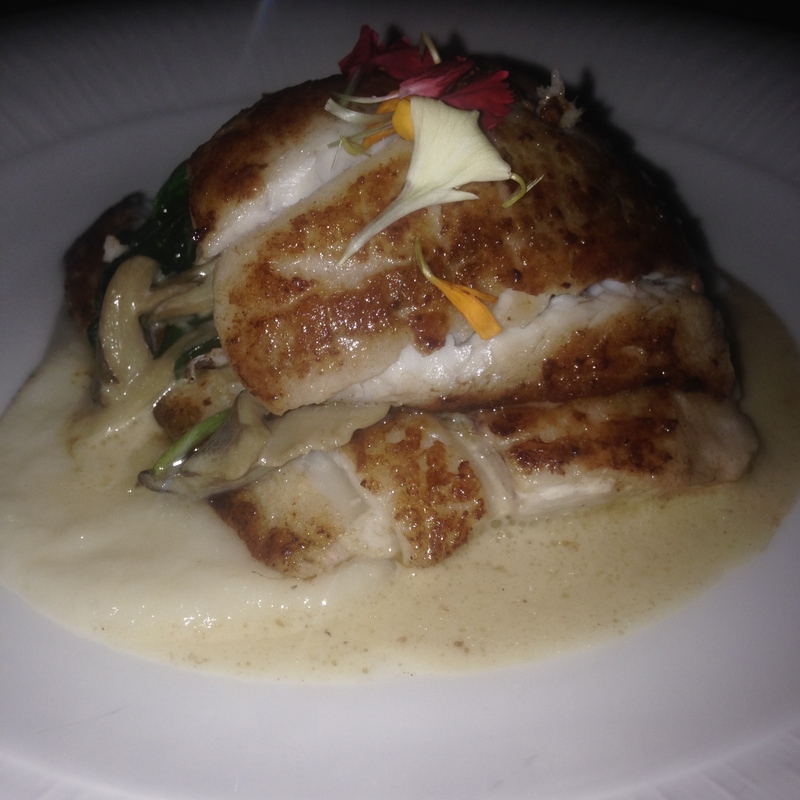 For my main course, I tried the North Carolina Flounder. I figured I’d stay consistent with the seafood tonight. The kitchen redeemed itself here from the first course. The flounder was perfectly seared and was moist. And the “Oysters” Rockefeller (read “Mushrooms Rockefeller”) it was stuffed with really gave the dish some “pop”. I liked it. It was all served atop a salsify purée. I had to admit I needed to Google what salsify was. Apparently it’s a plant that’s in the dandelion family. Whatever. It was a pretty good addition to the dish. All in all, I’d say the place is pretty good so far. The service was very friendly and excellent. At the end of my meal, Matt presented me with another Lion’s Tail, which I was very appreciative of. But since I always limit myself to one drink when I drive, I had to give it to one of my neighboring diners who I sparked some conversation with. I’ll need to check The Southern Gentleman out again some time so I can try items off of the regular menu so that I can give the food a fair overall assessment. Based on my experience tonight, though, I can tell you that it’s a great place to grab a drink, most certainly. The bartenders are those types that make you feel as though they have a PhD in Mixology, which means if you tell them what you usually like in a drink, chances are they can whip up the perfect and unique one for you. As a sidebar, I should caution you that this seems to be one of those restaurants where serving sizes are…what’s the word…conservative. Then again, maybe it was just the dishes they had on the special menu tonight, but that remains to be seen. So if you’re a big eater like me, you may find yourself stopping off at the Cook Out for a cheeseburger and banana pudding milkshake on the way home. Prices: Now, on the regular menu, most of the entrees are upwards of $20. However, there seemed to be some sort of markup tonight, given the special menu. Thank goodness I got my tax refund. Just be prepared to pay “upscale” prices. Perfect For: For dinner, special occasions. For drinks, anytime. What They Have: Unique and classic drinks, fancied-up American dishes. Should You Go? : If it’s a birthday, or anniversary, or other special occasion, then yes. If you want to grab a few drinks after work, this place is great for that too.